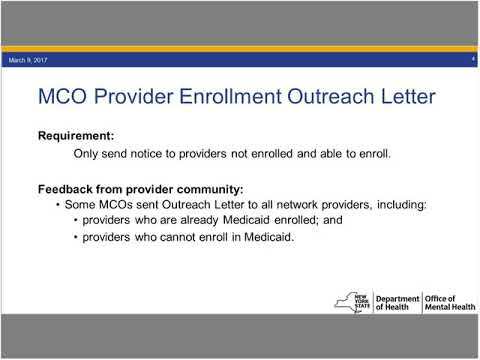 Representatives from the NYS Office of Mental Health (OMH) and Department of Health (DOH) held a webinar to clarify the provider enrollment requirements for OMH Licensed Providers and Designated Adult BH HCBS Providers. The webinar was focused on the recent DOH initiative to assure enrollment of enrollable MMC plan network providers into FFS Medicaid. The introduction of the 21st Century Cures Act in December 2016 points to a need to identify provider and agency types that may need to enroll before December 31, 2017. A document of Frequently Asked Questions on this topic is also available for download below.